Twice a week, precisely on Tuesdays and Fridays, Luigi from Turillo dairy company delivers the buffalo strips to me (pieces of fresh buffalo mozzarella cut into julienne strips). Last week he told me: “Enzo, I’ve got an excellent product, this too is made with buffalo’s milk, which I will let you taste”. After a few days, Luigi came to the pizzeria and he brought this new arrival. It is called Lattecotto di bufala whose production follows the old techniques of the cheese makers who, for the cheese softness, kept it into hemp rags. Unlike the fresh ricotta which is made from curdling only the whey obtained after extracting the curd, so it has a low protein content, Lattecotto contains unsaturated fats (mainly oleic acid) and a high protein value. Lattecotto is tender and creamed but, at the same time, it has a unique lightness, digestibility and genuineness just because it is made exclusively from milk. 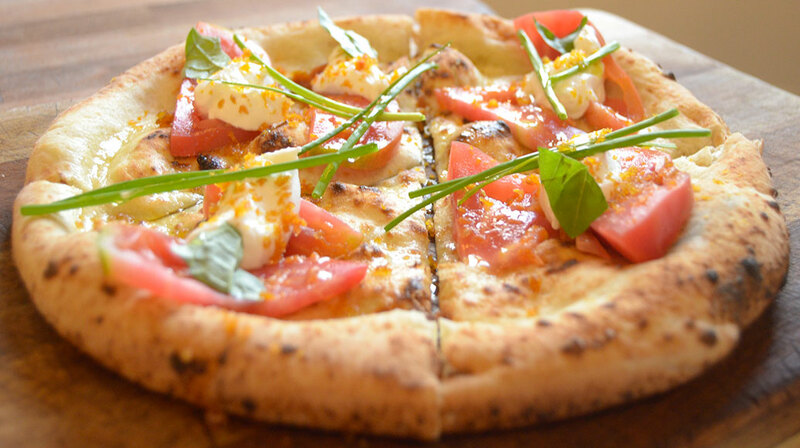 I immediately got the idea to make a fresh pizza, we can call it summer pizza, and I thought about a classic combination of ingredients: the caprese salad! As many people know, the caprese salad is prepared with Sorrento tomatoes, also known as cuore di bue (bull’s heart) due to its round shape, it is very fleshy and has to be eaten raw in salads to savour its sweet flavor. Then, it is added to the tomatoes the buffalo mozzarella, a sprinkle of oregano, some basil leaves and a little of extra virgin olive oil from the Sorrento Peninsula. I naturally chose to substitute Lattecotto for the buffalo mozzarella. However, in this way it wouldn’t have been a new recipe but only a mere copy! So, I decided to add some other ingredients while keeping my desire to offer my customers, and then myself, a fresh pizza for the hottest summer of the last centuries. Then, I add some grated gray mullet bottarga, which is dried roe of either tuna or grey mullet, an ancient sunbaked ingredient whose name in Arabic, batarikh, means “preserved in salt”. But, to complete the recipe, I needed two more ingredients able to match the bitter and salty flavour of the grated bottarga and the sweetness of lattecotto: a scent of lemons and chives. The magic comes true in a few minutes, you prepare the focaccia and then add, in order, the chopped tomatoes, lattecotto with a scent of Sorrento lemons on it, a sprinkle of bottarga, chives and a drizzle of extra virgin olive oil. The great beauty of the caprese salad and the Sorrento Peninsula are served on the plate!